The second Players Ring Gallery, another arena-seating venue, opened in September 1961 after the demolition of the original Gallery earlier that year. Three years later, after the Players Ring theatre was destroyed by fire, producer Paul Levitt moved the Ring’s remaining operations to the Gallery, where they remained until after Levitt died in 1968. In the 1970s the space was converted into the Gary, a classic movie house. It was later partitioned into two cinemas, the Gallery and the Quickie, that showed adult films. In the 1980s the building was converted back into a theatrical venue and reopened as the Pan Andreas, an equity waver theater. 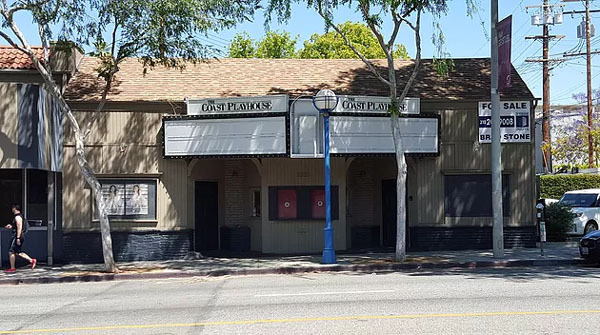 Later renamed the Coast Playhouse, the building was purchased by the city in 2016. Plans are in the works to upgrade it for use as a performance space. The first production after the move was “A Majority of One” (1961), written by Leonard Spigelgass. Gore Vidal’s “The Best Man” (1962). ”Purlie Victorious” (1962), written by Ossie Davis, starring Greg Morris (“Mission: Impossible”). ”Enter Laughing” (1964), based on the book by Carl Reiner. ”One Flew Over the Cuckoo’s Nest”(1965), with Warren Oates as McMurphy. Ran for four months. ”Who’s Afraid of Virginia Woolf?” (1965), with Ruth Warrick. ”A Case of Libel (1966), with Ted Knight as opposing counsel. ”MacBird!” (1967) – a big hit, ran for more than 250 performances. ”Enemy, Enemy” (1968), written by Bud Freeman, starring Richard Dreyfus.